The Bible, in and of itself, is a miracle. Think about it. Over centuries of time, God supernaturally moved in a number of men's hearts, leading them to record the exact words of God. God then guided His people to recognize these divine writings and to distinguish them from everything else that had ever been written. Later, God's people brought together these 66 books. The preservation and survival of the Bible were as miraculous as its writing. Finally, God gave men technological knowledge to copy and transmit the Bible so all people could have it. All this took place because God has something to say to you. In Foundations: New Testament, Robby and Kandi Gallaty lead individuals through the 27 divinely inspired books of the New Testament in one year, while still offering the flexibility of reading only five days each week. The HEAR journaling method will allow individuals to read and respond to God's Word as they highlight, explain, apply, and respond to passages throughout the yearlong plan. • Equip yourself with a greater knowledge and application of God's Word by digging deeper into Scripture by yourself or with a group. • Study Scripture by using a reading plan and devotions that make it easy to understand and apply God's Word, even if you're new to studying the Bible. 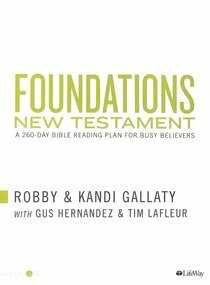 About "Foundations - New Testament: A 260-Day Bible Reading Plan For Busy Believers"
Robby Gallaty is senior pastor of Brainerd Baptist Church in Chattanooga, Tennessee. He is the author<P> of Creating an Atmosphere to Hear God Speak and his popular syndicated radio and television Bible-teaching program, "A Word from His Word," airs nationwide and online at awordfromhisword.org.